Stihl Leaf Blowers for sale from us in Newry, Northern Ireland are quality garden blowers for use by both professional gardeners and domestic users. 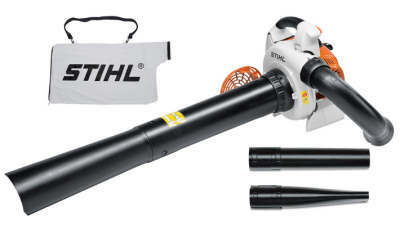 Stihl produce several different models of leaf blower. The Stihl BG56 hand held blower is their entry model with a 27cc 2 stroke engine - from there you have the Stihl BG86 with the same engine size at the BG56 except the BG86 has some added comfort features. The biggest of the Stihl blower range is the Stihl BR600 magnum backpack blower, top of the range leaf blower popular with councils, professional gardeners and foresty workers. Don’t let garden work be hard work. Ideal for cleaning up leaves and debris on paths or driveways around the home, the new powerful, low emissions Stihl BG 56 handheld petrol leaf blower features STIHL easy to start engine, making starting virtually effortless. Designed with a specialised stop switch and semi-automatic choke lever, the blower automatically resets itself to the run position while helping prevent accidental flooding for smooth starts. Vacuum adaptor kit available as an accessory to convert the BG 56 blower into a vacuum shredder. Packed with power and run by a fuel efficient low emissions engine, the new top-of-the-line Stihl BG 86 handheld debris and leaf blower has comfort features professionals will appreciate. Not only is this blower easy to start— thanks to the STIHL easy to start engine; it’s also fitted with our four-spring anti-vibration system and soft grip handles to help reduce operator fatigue. Vacuum adaptor kit available as an accessory to convert the BG 86 blower into a vacuum shredder. Powered by a low emissions engine, the new Stihl SH 86 professional shredder vac/blower has increased vacuum power and shredding performance that will blow you away. Fuel efficient and operator-friendly, this shredder vac easily converts into a handheld blower. Equipped with features like a special shredder blade on the fan wheel that reduces garden waste, along with the soft grip handles and a four-spring anti-vibration system— you have all the necessary comfortelements to ensure a smooth start and help reduce operator fatigue. Top of the range, The Stihl BR600 is particularly powerful backpack blower. With very high air throughput for the most extensive cleaning tasks. Superb power to weight ratio. Excellent anti-vibration system and ergonomic carrying frame. Innovative 4-mix engine for a more pleasant sound, low fuel consumption and low emissions. Stihl leaf blower for sale Ireland from AM Rentals in Newry. Call us today to order your leaf blower or garden blower and we can get deliver it to your county for just £10.00 extra! Check out our Husqvarna leaf blowers and our Tanaka leaf blowers for more great value deals on the world's biggest brands in garden machinery.